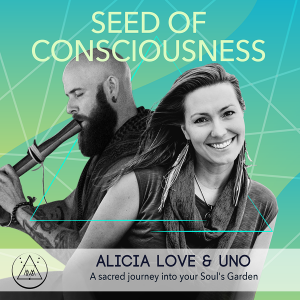 At Move-Ment Alicia & UNO will guide us on a sacred journey into our soul’s garden to open our hearts to messages our souls want us to know. Alicia Lauryl Love is a Mindful Spirit Coach leading regular Meditation Circles in Portland, Oregon . Alicia’s life has been guided by the innate wisdom of her soul from a very young age but while finishing her degree in Herbal Science from Bastyr University she had an awakening to her true calling, not to only to heal the physical body with natural medicine but to provide healing on the soul level and reconnect us to our wholeness. Through dance and community of women in circle, celebrating one another, Alicia knew the Divine Feminine within was calling her to lead women to embrace the sacredness within. In her sessions she leads clients to strengthen their connection with their own divine wisdom, power and self love. The Soul Loves the Truth! As a Certified Soul Coach®, Alicia Love is a guide to light the way, illuminating the path back to wholeness with techniques to align your inner spiritual life with your outer life. She offers guided mediation journeys to connect to the soul’s wisdom so you can discover your purpose and step into your power with loving connection to your heart. Alicia coaches 1:1 world wide, facilitates workshops and offers guided meditations online. Ariel Jose Campos , known by many in the spiritual community as UNO, has been leading guided mediations through vibrational sound medicine since 2000. Uno has traveled to many states across the U.S. sharing his native indigenous sacred sounds at events from yoga studios to VegFest to invoke the journey within. During his awakening in 1998 he knew at that very moment that he had to share his love of Spirit through music to all those who are open to receive the vibrational medicine healing. Uno is also an educator of many of nature’s planet medicines and shares his knowledge and passion for the healing prosperities of herbs and mushrooms through his business called Sacred Health Solutions.